If your smile looks or feels incomplete because a tooth is missing, we would love to speak with you about dental implants. Dental implants can provide a secure anchor in the jawbone to complete and permanently fill out your smile. Westlake Family Dentistry can complete the entire implant process – from precision surgical placement to the final restoration – all within the comfort of your Lake Oswego dental home. Is a Missing Tooth Really Such a Big Deal? The short answer is yes – it can be. The visible part of a tooth – the hard, white crown at the top – is a bit like an iceberg; there’s a lot more under the surface. Each tooth is also connected to the jawbone by a long root. When a tooth is missing, the gap left behind not only looks unattractive, but can lead to the breakdown of overall facial structure and problems with other teeth or gums. When the separation left by an absent tooth goes unfilled, the jawbone under the space will begin to deteriorate or atrophy. The alignment and bite of the mouth can change, and your overall oral health can be compromised. At this point, you may be asking, “Well, what’s the good news?” The good news is simply this: a dental implant can solve and prevent these problems. Modern dental implants are considered the gold standard in tooth replacement by both doctors and patients. Implant success rate is high (almost 98%!) because they mimic natural teeth so well. 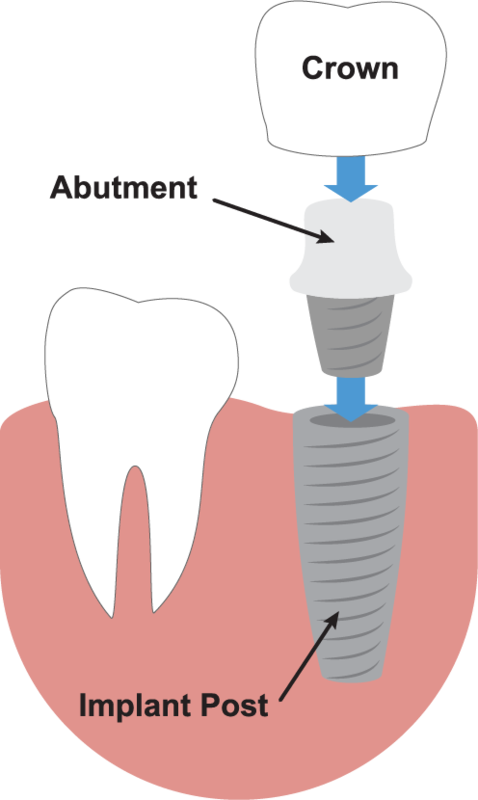 Rather than only replacing the visible part of an absent tooth with a traditional crown restoration on top, an implant replaces the tooth at the root with surgical insertion of a titanium post. The nature of titanium permits the implant post to fuse with the jawbone over time, minimizing bone loss and preventing surrounding teeth from shifting. Because implants cannot be removed, they are cared for the same way as natural teeth – with the added benefit of being virtually impossible to break. Because implants are so strong – intended for lifetime use – they provide a level of comfort and safety that traditional dental appliances are unable to match. Your suitability as a dental implant candidate is determined by Dr. Sievert as an introductory part of your smile makeover plan. Your gums and jaw need to be of moderate health with enough bone density to ensure a positive implant therapy outcome. After the titanium post has fused completely with the jawbone, crown restorations that replace your missing tooth can be attached and secured to the jaw quickly and effectively. Dr. Sievert uses cutting-edge digital imaging technology to encourage precision implant placement, factoring in the spacing of your teeth, your bite alignment, bone quality, and the unique anatomical structure of your face. If you have any questions about dental implants or you’re ready to schedule a visit with your Lake Oswego implant dentist, Dr. Sievert at Westlake Family Dentistry, give us a call or request an appointment easily online below. We can’t wait to smile with you!